It improves memory and focus The cocoa flavanols found in most chocolate products have been shown to reduce damage to nerve pathways, as seen in Alzheimer’s patients. These same flavanols help boost blood flow in the brain and may help you feel more alert: a small British study showed that those who consumed chocolate beforehand performed better on counting tasks. It’s a Heart Helper Cocoa’s inflammation-fighting properties have been shown to protect the heart, helping increase blood flow to the muscle and even lower cholesterol. The British Medical Journal suggests that regular consumption of chocolate can help lower the risk of developing heart disease by up to one third. Its more “diet friendly” than you think Dark Chocolate is high in fiber, which helps you feel fuller longer and may help reduce your cravings for other junk food. 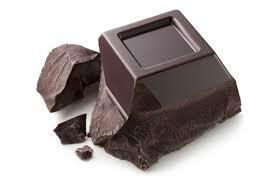 It’s good for your skin Chocolate is also good for the largest organ of your body—your skin. Despite the belief that chocolate leads to breakouts, the antioxidants found in dark chocolate are good for your complexion, and may even protect it from damaging UV rays. It’ll help boost your mood How good does it feel to indulge once in a while? Plus, with chocolate now known to provide all of these health benefits, you should feel even better about allowing yourself a little bit of chocolate now and then. Just remember… A healthy daily serving of dark chocolate is about 1 oz. Regardless of what your fitness goal may be (weight loss, increased strength, better endurance, or some variation thereof), you probably already know that the time and effort you log in to the gym only goes so far in getting you there. Yes, putting that time in is essential in reaching your goals, but just as essential is the fuel you choose to put into your body before and after your gym session. However, this piece of the fitness puzzle remains puzzling to many. What should I eat before a workout? How much protein do I need? What is the best thing to eat after I work out? I’m completely lost on what kind of protein supplement to use. You get the idea. Nutrition, but especially pre- and post-workout nutrition, is confusing. Your body goes through a series of chemical reactions every day: it breaks down nutrients, digests food, builds muscle tissue, and stores or expends energy… all while you go about your daily activities, completely unaware of everything your body is doing. So it makes sense that all the science that’s happening in our bodies this very moment is overwhelming—after all, we can’t see it happening, and getting closer (or further away) from our goals is the product of long-term dedication and consistency, sometimes a trial-and-error process of what does or does not work where nutrition is concerned. In this blog, we’ll try to make that learning curv a little easier. Before we talk about food itself, lets talk about macronutrients—carbohydrates, protein, and fat. CARBOHYDRATES: Everyone’s favorite, these are your body’s preferred energy source, key for helping you recover after training and building muscle. Think starchy vegetables, grains, fruit, and, to some degree, dairy products. There is also what I call the “engineered” variety: processed flour, refined sugar, and corn syrup—all of which should be used sparingly. PROTEIN: lean meats and fish, eggs, soy, nuts, and dairy. Protein is often considered the “muscle builder,” and the best friend of all those heavily muscled bodybuilders you see on the cover of fitness magazines. But protein is important whether you’re a bodybuilder or not: it’s digested slowly, which means it helps keep you satisfied longer—great, even if your goal is weight loss. FAT: oils (olive, canola, coconut), avocados, nuts or nut butters, seeds, fatty fish, full-fat dairy (butter, ice cream), and certain cuts of meat. Fats are important to keep your internal organs and skin healthy, and they help maintain steady blood sugar. Again, be sure to steer clear of engineered fats, such as trans fats, which are known to cause a list of health problems. You’ve more than likely become familiar with all of these terms in various contexts, probably in terms of “eat this, not that.” The truth is, all of the macronutrients are important in their respective quantities, especially where pre- and post- workout are concerned. With that said, what should you be eating before and after you work out? Regardless of your overall goal, the purpose of pre-workout nutrition is to avoid low blood sugar, which can make your workout seem much more difficult than it actually is, hindering your ability to work to full capacity. When timed right, what you eat before your workout provides fuel for your muscles to promote growth and function. Ideally, your pre-workout meal will be forty-five minutes to an hour before your training session, and will consist of carbohydrates and some protein. The food types you select will largely depend on your personal preference, as well as your tolerance to certain types of food. For instance, some people find it difficult to digest many high-fiber carbohydrates, so some trial and error may be necessary to find out which foods work best for you. You will want to keep your pre-workout meal relatively low in fat, because fat takes longer to digest with respect to protein and carbohydrates, and can’t be processed as quickly for energy. A good starting point for judging your pre-workout food intake is to multiply your bodyweight in pounds by 0.5g to yield the number of grams of carbohydrate to take in about an hour before working out. 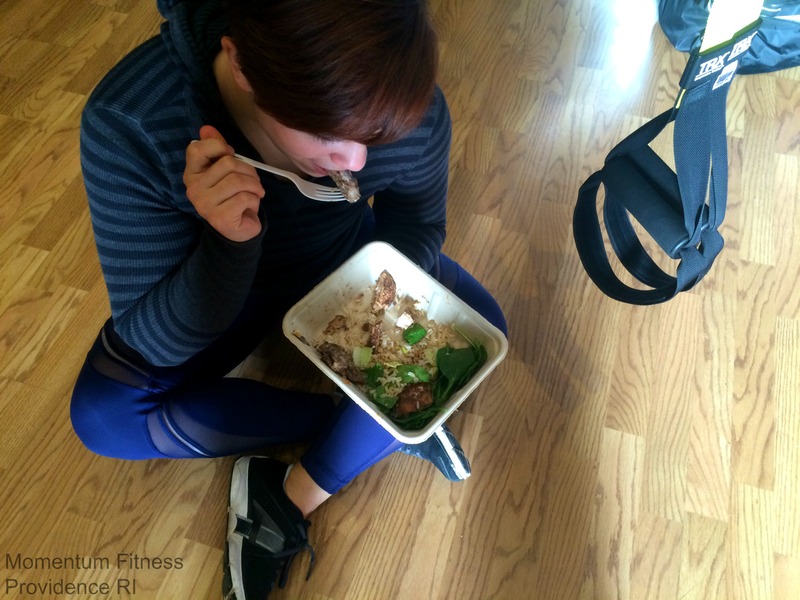 If you’re just going to head to the gym to do mostly cardio, it isn’t necessarily imperative that you eat before you work out provided you’ve been eating normally throughout the day. If you feel your energy level start to plummet, a small snack (a piece of fruit, a small yogurt, half a protein bar) should be all the pre-workout nutrition you need, provided your activity level won’t be longer than an hour. The hard work is done, and recovery begins right when your workout ends. Muscles begin to use protein made available from your blood and use it to build and repair muscle tissue. Your energy stores are also somewhat depleted, and your body is looking to replenish them with carbohydrates. Protein becomes even more important here as a partner to carbohydrates. A good refueling strategy would be to have a meal consisting of a 3:1 ratio of carbohydrates to protein to promote the release of insulin and help replenish energy stores by drawing glucose into muscles. But what about protein shakes? You’re probably thinking. The issue here is not in the supplement itself, but in the supplementation for supplementation’s sake. That is, many people will go out and purchase a protein powder while paying very little attention to where the gaps in their diet may actually be, and, even worse, may forget that a supplement is exactly that—a supplement. There are many benefits to using a good quality protein supplement, and one of these is to ensure that you take in enough protein to support your level of activity. Many people do not get enough, and a supplement can be a helpful way to make sure you do. Some people find that liquid meals are easier for them to digest than whole-food meals, particularly before and after exercise, so they tend to favor a post-workout shake. Whatever the reason, it is key to remember that protein supplements can only offer so much as far as other nutritional content besides protein, and spending your money on a protein supplement may not be critical to your success in the gym. Bear in mind, there’s no one-size-fits-all approach, as everyone has different fitness goals, nutritional needs and sensitivities, and body types. But hopefully, armed with some of the information in this article, you’ll find you have more energy and get more out of your workouts, recover faster from them, and be that much closer to reaching your goals. We will have to close the gym today at 10am due to the inclement weather and parking ban. Momentum Fitness will be open from 8am-12pm today. Hope you enjoyed the snow! Momentum Fitness is closed due to the inclement weather and parking ban. Have a great day!